By now, it’s pretty common knowledge that The Rock gets down to some Strange Music and Tech N9ne during his ridiculous workout regiments. The Hollywood actor and WWE Superstar has continuously expressed his love for the Kansas City King, even putting him in his top five emcees. 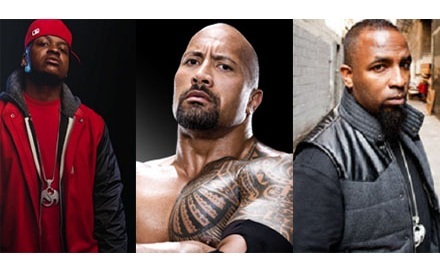 What some may not have known though is that The Rock also throws some Stevie Stone into the mix, as he revealed this past weekend via Twitter, when he shared which emcees motivated him through his workout. Adding the #Momentum hash tag, we can only assume The Rock was put on to Stevie Stone’s most recent EP, Momentum. With tracks like “Momentum” and “Turn It Up”, you can probably guess what kind of pace The Rock is keeping. CLICK HERE TO PURCHASE MOMENTUM! How do you feel about The Rock always showing love to Strange Music?